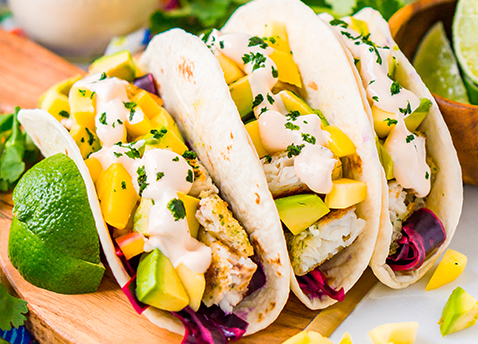 The best thing about EATING these fish tacos from Sugar and Soul is the refreshing taste of tilapia, lime, mango, and avocado in every bite. The best thing about MAKING these fish tacos is that in just 25 minutes, you get to eat them. Combine shredded cabbage, sugar, and lime juice in a bowl to pickle. I recommend doing this the night before if possible for even more flavor. If using the Fish Taco Sauce, mix together all sauce ingredients in a small bowl and chill in the fridge for at least two hours before using. 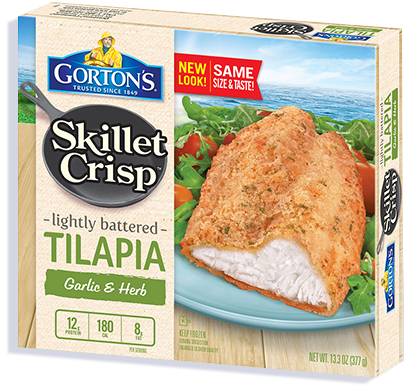 Cook the Gorton’s Skillet Crisp Tilapia according to package directions, once cooked, cut the fish into chunks. Add layers of pickled cabbage, tilapia, avocado, mango, and fish taco sauce on the flour tortillas and enjoy. If skipping the sauce, you can also use a fresh pico de gallo. 5-Star Tilapia® lightly coated in garlic and herb seasoning.